The film opens with Perlman deep, so very deep in the Korean jungle, facing off against a worthy adversary. We quickly move from that war to the war at home which is a populated with a starkly juxtaposed community, populated solely by war mongering weapon tech geek militants and their flower wielding, drug addled, artistic counterparts. We’ve all seen this before, but the richness of the scene and texture in Moonwalkers breathes new life into this otherwise tired trope. I haven’t even mentioned Kubrick yet. Christ! So… set in late 1960’s U.S. military backrooms and the old school gangster streets streets of London, Moonwalkers is supremely simple. The American government is worried about being globally embarrassed in the event of a failed moon landing. They’ve got their boys hurling towards that mysterious orbiting rock, but certainty is elusive and they want/need a backup plan. A little (now giant film) known as 20o1: A Space Odyssey happens to be making a lot of noise at this very time in history. 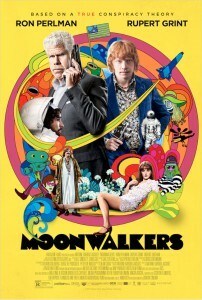 Moonwalkers would have you believe that a CIA agent is deployed to the UK with the mission to track down that very film’s creator and attempt to commission him to create/fake the moon landing as a backup plan in the event that something goes wrong with the actual mission. Problem is the CIA agent (Perlman) doesn’t get the real Kubrick and is instead left to rely on an unreliable manager of a failed UK rock band, to find a solution which ultimately leads to a rotund and heavily intoxicated “film director”. I’ll leave the nitpicking f0r my shows at The Film Vault and CinemAddicts, but can tell you that Moonwalkers is less about what happened and much more about how it happened. Some great details and just enough nods to Stanley Kubrick himself to not come off as exploitative and or disrespectful. Posted on Wednesday, January 13th, 2016 at 1:15 am and is filed under Reviews.